Meet the tobacco hornworm, a caterpillar that regularly eats tobacco leaves loaded with nicotine. Research now shows this little bugger has a strange and unique defense against hungry spiders: It "puffs out" nicotine, creating a kind of toxic bad breath. There are a number of plants out there with chemical defenses that deter herbivores. 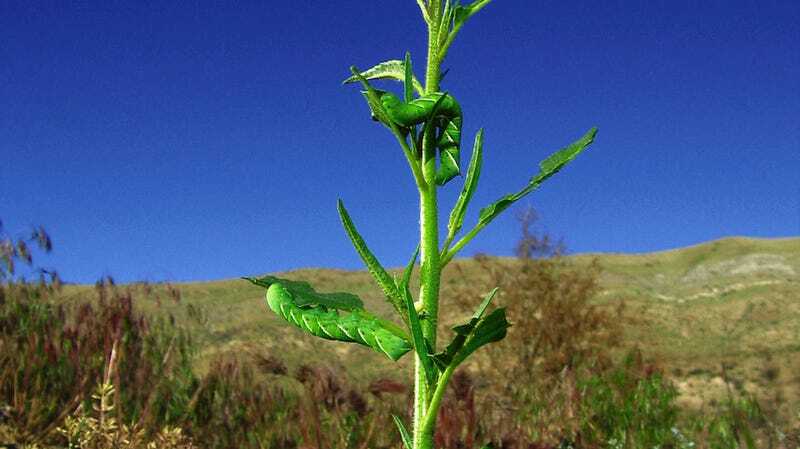 But some herbivores, especially moths and butterflies, have adapted to eating these toxic plants. Some have even found ways to co-opt those plant toxins to use in their own arsenals against predators. The eastern tent caterpillar (Malacosoma americanum), for example, pukes up the chemicals hydrogen cyanide and benzaldehyde when ants attack it. On the other hand, the Atala butterfly (Eumaeus atala) is unpalatable to birds and ants because of the toxic chemical azoxyglycoside, which it gets from the cycad plants it eats. The tobacco hornworm (Manduca sexta) is an incredible case, explained Ian Baldwin, a molecular ecologist at the Max-Planck-Institute for Chemical Ecology in Jena, Germany. "It has the world record for nicotine resistance, and can handle it better than any other animal on the planet," he told io9. Each day the caterpillar ingests six times the lethal dosage of nicotine for humans. In the past, research had suggested that the caterpillar might be able to utilize the nicotine in its diet as a kind of defense. For one, researchers found that larval parasitic wasps were more likely to die if they grew up inside tobacco hornworms fed a high-nicotine diet, compared with those fed a low-nicotine diet. The predatory argentine ant (Iridomyrmex humilis) also prefers their caterpillars to be nicotine-free. But just how the caterpillar co-opts the toxin and uses it in its natural habitat has remained a mystery. So Baldwin and his colleagues decided to find out. To start, the scientists sought to find out how nicotine affects the hornworm's survival in its natural habitat. They modified some coyote tobacco (Nicotiana attenuate) by silencing the plants' nicotine production and accumulation, and then transplanted them into a test field in Utah (their native range). They then compared the overnight survival rates of caterpillars eating the modified tobacco with those eating regular tobacco — the former caterpillars were far more likely to die. When the researchers checked out the habitat at night, they found tons of wolf spiders roaming around the N. attenuata field, suggesting the arachnids were eating the hornworms. Back in the lab, they tested the spiders' feeding habits with caterpillars that had diets of varying degrees of nicotine. They found that the wolf spiders, like the argentine ants, preferred their meals to be nicotine free. From this, it seemed that the caterpillar's nicotine-rich diet really does help it survive. Wolf spider's reaction towards caterpillars fed a nicotine-rich (top) and nicotine-free (bottom diet). Courtesy of Sagar Pandit. Next, the researchers decided to discover how the hornworms were utilizing the nicotine. In a previous study, they found that a gene that's normally expressed in the caterpillar's midgut, CYP6B46, isn't as active in hornworms that are fed plants with suppressed nicotine production. This seemed a good place to start, so they created N. attenuata plants that are able to silence the caterpillar's CYP6B46 gene. Sure enough, caterpillars with the silenced gene became very attractive to spiders. Further work showed that the gene is able to take some of the nicotine in the caterpillar's midgut and transport it to the hemolymph (its blood). Nicotine, Baldwin explained, works by attacking the acetylcholine receptor, which "drives the neuromuscular function of all animals on the planet." What's more, there are no acetylcholine receptors that are resistant to nicotine, meaning that caterpillars aren't necessarily able to eat tobacco because their receptors are resistant to nicotine. "The way the caterpillar handles the nicotine is that it poops it out," he said. The work with the CYP6B46 gene shows that the hornworm doesn't poop out all of the nicotine — it transports 0.65 percent of the nicotine it ingests into its blood. Why does nicotine help you lose weight? But how does blood laced with nicotine help the caterpillar? The researchers figured that M. sexta must exhale the nicotine through their spiracles, which are small respiratory holes they breathe through — the nicotine warns the spiders that the caterpillar is toxic. To see if this was true, "we glued little nicotine trapping devices on the spiracles and then took them off after the spider caught the caterpillar," Baldwin said. The devices showed that the tobacco hornworms were puffing out nicotine from their spiracles when the spiders attacked. "Normally, it would work as a type of toxic halitosis, or bad breath." Interestingly, this defense doesn't work for all predators. The scientists discovered that the big-eyed bug Geocoris pallens, another major predator in the N. attenuata field, wasn't deterred by the caterpillar's nicotine-rich breath. Baldwin thinks this may be the case because the bugs only feed on the hornworms' hemolymph, which has very low levels of nicotine. The spiders, on the other hand, eat the caterpillar's nicotine-loaded gut. Still, the study is the first documented case of a "toxic bad breath" and an animal being able to use its exhalation as a signal that it has eaten something poisonous, he said. The research also highlights how important field studies are for determining what individual genes do. "We've discovered the function of the gene CYP6B46 in the caterpillar because of a spider in the field," Baldwin said. "This shows that nature is an important laboratory for discovering gene function." Check out the full study in the journal PNAS. Top image via Danny Kessler. Inset images via Pavan Kumar and Danny Kessler, respectively.